You'll be £8.00 closer to your next £10.00 credit when you purchase Greece and Rome at War. What's this? In this sumptuous guide to twelve centuries of military development, Peter Connolly combines a detailed account of the arms and armies of Greece and Rome with his superb full-colour artwork. Making use of fresh archaeological evidence and new material on the manufacture and use of the weapons of the period, the author presents an attractive and impressive volume that is both scholarly and beautifully presented with illustrations that are, quite rightly, recognised as being the best and most accurate representation of how the soldiers from these formidable military empires appeared. Greece and Rome at War lucidly demonstrates the face of battle in the ancient world. Covering the wars between the Greeks and the Persians and the epic contest between the Romans and their most capable opponent, Hannibal, as well as organisation, tactics, armour and weapons, and much more, this excellent work brings the armies of Greece, Macedon and Rome vividly to life. This new revised edition contains a Preface by Adrian Goldsworthy. This book covers a vast period of time. Connelly uses a very wide range of sources. Connelly has produced detailed analysis of the campaigns, the sources and the battlefields, based on his extensive visits to the battlefields, reconstructions of the ancient terrain and a detailed knowledge of the ancient sources. This is a splendid study of the ancient Greek and Roman war machines, looking at how they were organised, how they fought and how they were armed and equipped in a readable but still detailed manner. Connelly's work is a classic if military history and should be in the library of anyone interested in ancient warfare. This book has become something of a classic. Connolly possesed a unique combination of skills. He was an able author and talented illustrator with a lifelong passion for the archaeology and history of the Greco-Roman world, in aspects of which – weaponry and battlefields – he became a noted authority. This, his largest book, was like his many others lavishly illustrated with his dazzling trademark colour illustrations of artefacts and reconstruction scenes, accompanied by a clear and authoritative text. This volume remains the best introduction to armies, soldiers, weapons, battles and war among the classical Greeks and Romans, and their enemies. Lavishly illustrated with his (the author) dazzling trademark colour illustrations of artefacts and reconstruction scenes, accompanied by a clear and authoritative text. 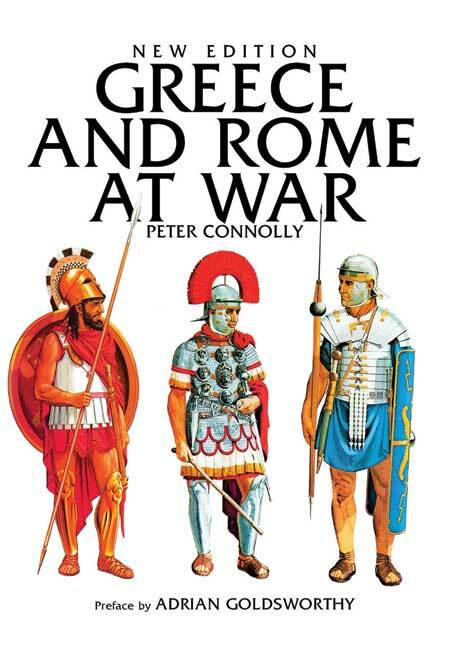 This volume remains the best introduction to armies, soldiers, weapons, battles and war among the classical Greeks and Romans and their enemies. Do you need an excellent guide to ancient warriors for toy soldier and model figure projects? Then look no further. The author combines detailed study of ancient arms and armies with his stunning artwork. This scholarly and visually stunning book is highly recommended.